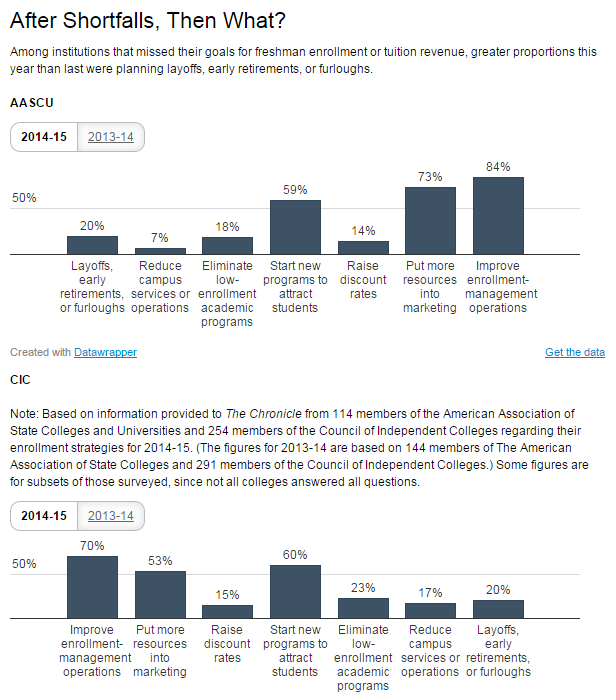 A recent article in The Chronicle for High Education “Goals for Enrollment and Tuition Revenue Elude Many Colleges” (13 October 2014, subscription required), gives interesting insights on the simplistic and unimaginative actions taken by colleges and universities when enrollment goals and tuition revenue are not met. The survey limited responses to these seven items. Perhaps people are doing other things as well, but these are likely to be the focus areas. Let’s deconstruct these and compare it to how a Lean organization would deal with the challenge of meeting enrollment (sales) and tuition (revenue) goals. 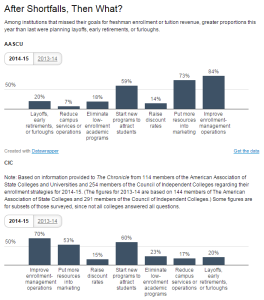 Conventional Thinking and Action: The general approach to meeting enrollment and tuition goals is results-focused, i.e. do whatever you can to solve today’s problem, worry about tomorrow’s problems later. Improve enrollment-management operations means to hire people (spend money) and improve a few key processes in an ad-hoc manner. Start new programs to attract students means to make informed guesses as to at what students and industry wants. Put more resources into marketing means to hire people and spend money. Eliminate low-enrollment academic programs means to throw away past investments because they do not deliver a financial return at the present time. Layoffs, early retirements, or furloughs means to reduce costs by getting rid of people. Reduce campus services or operations means to reduce costs by reducing or outsourcing campus services or operations. Raise discount rates means to spend money. Lean Thinking and Action: The general approach to meeting enrollment and tuition goals is process and results-focused. People would use of structured problem-solving processes (i.e. the scientific method) and kaizen (“spend ideas, not money”), to improve the results for today and establish a foundation for continuous improvement in order to respond effectively to tomorrow’s problems. Improve enrollment-management operations means to improve processes and re-focus or re-deploy people. Start new programs to attract students means to carefully identify new areas of study based on quantitative and qualitative data, involving students, payers, and employers. Put more resources into marketing means to improve processes and re-focus or re-deploy people. Eliminate low-enrollment academic programs means to understand the causes of low enrollment and improve the the academic programs prior to combining or eliminating them; involve key stakeholders in the process. Layoffs, early retirements, or furloughs are the last resort, and signifies that senior administrators (president and provost) have failed and must resign. Reduce campus services or operations means to identify services and operations seen as valuable by students, payers, and employers and improve them. Raise discount rates means means to improve the value proposition for students, payers, and employers before resorting to discounts (and perhaps even raise prices if the perception of value is great). I hope that this example effectively illustrates the difference between conventional management and Lean management, and how Lean is much better suited for dealing with the kinds of common problems that educational institutions face.